Rich, dense and featuring ricotta, not cream cheese, our Italian cheesecake would make anyone's Mamma proud. Preheat oven to 350°F if using a silver 9-inch springform pan (or to 325°F if using a dark nonstick 9-inch springform pan). Mix crumbs, butter and 2 Tbsp. sugar. Press firmly onto bottom of pan. Bake 10 minutes. Meanwhile, beat ricotta cheese, 1-1/4 cups sugar and flour in large bowl with electric mixer on medium speed until well blended. Add whipping cream, vanilla and zest; mix well. Add eggs, 1 at a time, mixing just until blended after each addition. Pour over crust. Bake 1 hour and 20 minutes or until center is almost set. Run knife or metal spatula around rim of pan to loosen cake; cool before removing rim of pan. Refrigerate 4 hours or overnight. Store leftover cheesecake in refrigerator. Serve this rich and indulgent cheesecake on a special occasion. It's sure to be a hit with your friends and family! 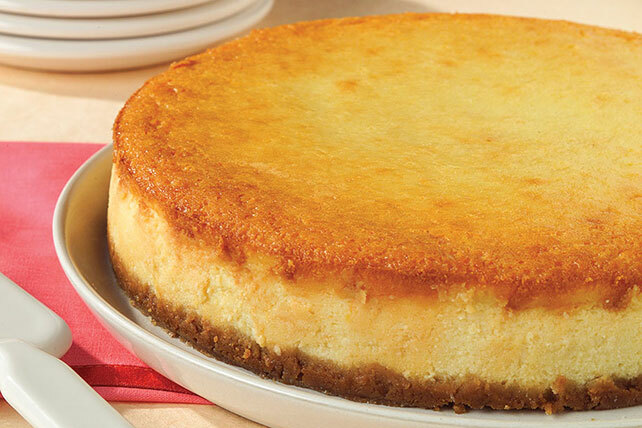 To avoid overbaking a cheesecake, check for doneness at the minimum baking time by gently shaking the pan. If the cheesecake is done, the edge should be slightly puffed and it will be set except for a small area in the center that will be soft and jiggly. Do not insert a knife into the center as this may cause the cheesecake to crack during cooling. Cheesecake can be prepared the day ahead. Cover; refrigerate until ready to serve.